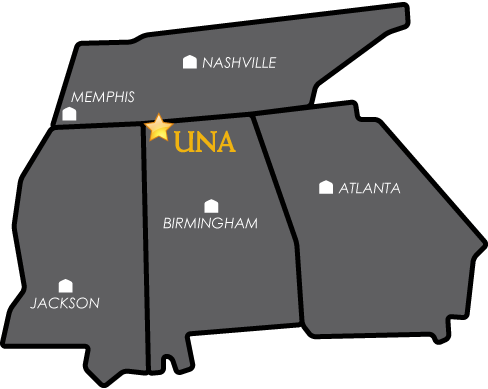 These documents provide management framework for responding to major emergencies that may threaten the health and safety of the UNA community, or disrupt its programs and operations. The plans address earthquakes, fires or explosions, hazardous materials, extended power outages, or other major events. The University of North Alabama Emergency Plan establishes a line of communication, and an Emergency Management Team (EMT) that ascertains the scope of an incident and advises the University President. The Emergency Management Team establishes response strategies, deploys resources, and initiates the emergency process. The Emergency Management Team will mobilize at a central Emergency Operations Center (EOC), located on campus, and at the selection of the Emergency Management Team Leader. In the event of an emergency the EMT will set up a base of communications with other campus first responders via the campus two-way radio communication system. The University Police Channel will be cleared and set aside for all emergency radio traffic. The Maintenance Channel will be used to direct other campus personnel. The EMT will gather information from and disseminate emergency bulletins and announcements to offices of the Vice Presidents and Division Heads using the emergency radio Maintenance Channel. Separate department emergency plans should be developed in each academic division. These documents should outline strategies to protect department personnel, programs, and should be coordinated with the campus emergency plan. The Safety and Emergency Preparedness Committee will review the Plan documents annually and meet to provide general oversight for related policies and procedures.